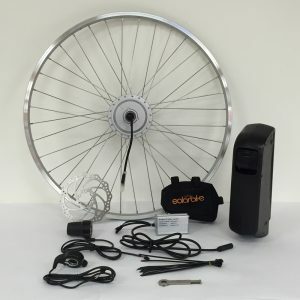 These kits are reserved for people who want an absolutely huge riding range whilst maintaining a battery that fits within the frame of the bike. The new Tiger Shark moulds that house the battery cells have been designed to work with the latest in PANASONIC lithium ion battery technology; this has allowed a couple of different sized batteries that can still fit within the triangle of a man’s bike. Having a 21Ah battery capacity mount within the frame in such a neat design is nearly unheard of. 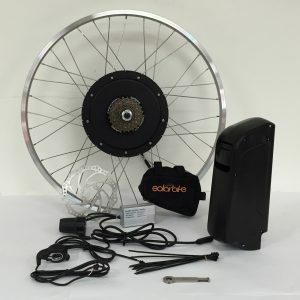 If you want range and handling then this electric bike conversion kit may be the one of choice for you. 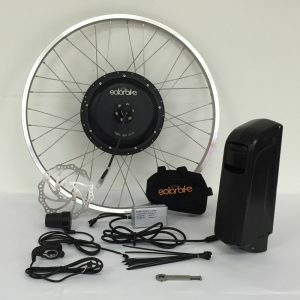 The recent development by PANASONIC of the 3500mAh cell has created the highest power to weight ratio electric bike batteries commercially available. 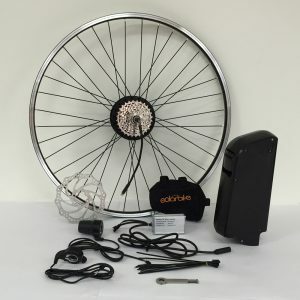 The kits are available with front and rear rims in a range of rim sizes. Mini-motor use either 200W or 350W powers whilst 500W uses the larger direct drive motor. 200W is the legal limit for riding on the road.